Congratulations, Your Holiness, and welcome to your first day at the Holy See. After being elected by the College of Cardinals, you'll need to don the papal vestments and get right to work. Armed with this manual, compiled over the last 2,000 years, you'll be able to navigate the Why's, How's, and Who's of your new life as Pontifex Maximus. What is your official job title? Why do you need to choose a papal name? Who does your laundry? While the church has long maintained an aura of complete secrecy to outsiders, the facts, figures, and historical anecdotes found here give the crucial information you'll need to fulfill your papal duties. 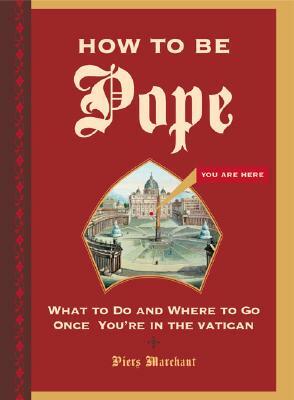 Detailed diagrams reveal significant locations within the Vaticanwhere to buy gas, where to mail a letter, St. Martha's Housewhile helpful illustrations demonstrate how to perform the papal wave, the uniform of the Swiss Guards, and how to tell the difference between a mitre and a stole. All this plus a Latin primer, tips on greeting world leaders, and a list of job benefits makes for an indispensable guide to performing the role of Successor to the Prince of the Apostles. Piers Marchant is a journalist and editor who has published travel guides with Fodor's and Not for Tourists. He lives in Philadelphia.